If you're growing tired of gray or white kitchens, maybe it's time to add a splash of color to the most-used room in your home. We love neutral design as much as the next decorator, but there's just something about bold colors that excite us—and we're all about red right now. Whether you gravitate toward modern, farmhouse, or eclectic, red kitchens work with a wide variety of styles and designs. This spunky kitchen from Kathy Marshall Design is anything but typical. 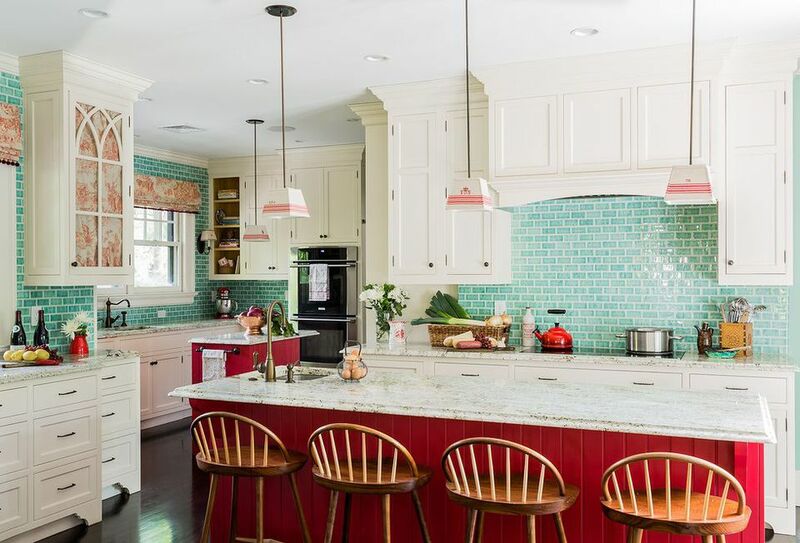 The ocean-inspired teal backsplash is the perfect canvas for the bright red kitchen island. It's easy to go overboard with red, but this kitchen perfectly incorporates the color to give the room an energetic pop. Here are even more ways to utilize red in your kitchen's decor. If you're worried about going red-wild, sticking with exposed upper cabinetry and just painting the lower cabinets is a great way to add some vibrant color without it becoming overpowering. This kitchen spotted on Grand Illusions LLC's Pinterest is everything we love about bright, splashy kitchens. The crisp cherry red feels modern and unique while maintaining an updated subway tile look throughout the rest of the kitchen. If you want to add some vintage flair to your kitchen, a bright red stove like this one from pandora.maxton is an easy update that can transform your space. Because red is such a vibrant, attention-grabbing color, even just one appliance is enough to make a strong impression. This kitchen pulls the fire engine red color throughout using artwork and accessories. We often see red utilized in either brand new modern kitchens or in country cabin-style kitchens that have a rustic feel. This space from Twice Remembered represents the latter, utilizing wood details such as this white farmhouse cart to produce a warm and cozy vibe. We get it—red can be a scary color to use in your home decor, but this kitchen designed by Jessica Helgerson proves that it can pack a powerful punch even if you add just one piece of red furniture. But adding just two metal barstools makes the otherwise neutral white kitchen feel a lot more lively. This modern kitchen from Thony features all the trendy features we love: a deep farmhouse sink, exposed shelving, and crazy bright colors. Though this kitchen is small, sharp hues like red really open up the space and make it feel roomy. When picking such a color, stick to neutral dinnerware to keep from overpowering. If bright candy apple red is too much for you, this deeper red stove seen on Homebunch may be more up your alley. When paired with a deep dark gray, this space gives off a calm, feng shui-friendly energy that makes us want to spend the whole day baking. This deep red bench from Katie Ridder makes us think fondly of a 1950s diner. Similar to the bar stool idea above, this bright pop of color doesn't require a coat of paint, but still achieves the same warm effect. You may need shades for this bright kitchen from Levi_Interiors, but we think it's both stunning and a little spunky. We've already been plotting ways to use neon signs in our home, but this neon red kitchen is just as much fun. Dieters beware—incredibly bright colors such as red are thought to stimulate the appetite! This rustic red kitchen seen on The Lettered Cottage uses a distressed wood technique to give the room a vintage quality. It's incredibly easy to make new wood look old and can help tone down the bright red hue if you want a more subtle look. This wide-open, natural light-filled kitchen from lotusdesignpro is beautiful on its own, but the red cabinets make the space feel inviting and unique. If you have old cabinets in need of an update, a splash of red paint can go a long way toward covering up blemishes and aging wood to make your kitchen look brand new again. In love with red, but not quite enough to commit to painting the whole kitchen? This DIY kitchen island from Just the Woods is an incredibly easy way to incorporate this bold color. A bright red bookshelf for your cookbooks or a couple of exposed shelving units offer other easy ways to make your whole space pop. Painting cabinets or walls is an easy way to make over your kitchen, but we love the idea of swapping out old countertops with bright red ones, like in this kitchen spotted on Pinterest. The white cabinets keep the space from feeling overly retro, but the red countertops add just the right touch of intrigue. In this updated kitchen from Dawn Hearn, red is a minor player—but one that still shines brightly. Between the striking red sink and the pops of red accessories, there's just enough color to give this kitchen warmth, but it's still neutral enough to feel modern. This cozy, retro-inspired kitchen from The Sweetest Occasion has the cutest red stove that gives the room an inviting touch of charm. If you don't want to hunt for a new stove, a bright red fridge or even a standing mixer is enough to give the space the feel of an old-fashioned soda fountain. Most of the red kitchens here are bright and perky, but this deep red kitchen from Lands End Development is just as striking. Darker, moody colors can make any room feel both dynamic and soothing, and help a large open space feel more intimate.